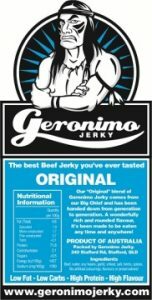 Geronimo Jerky review: Taste, texture, ingredients, and value. Geronimo jerky started in Queensland in 2011. Four friends started working part-time to make jerky from an American family recipe. Geronimo was among the first businesses to make quality jerky in Australia, and they have since moved their business to a café in North Brisbane. Geronimo offers 8 different flavours online. There is an original, a ginger, a pepper, a guarana flavour (! ), and then 4 spicier jerkies. We’ve tried them all! Of course, they also have a cafe, so can probably give you a broader offering if you go to visit them in Brisbane. The Geronimo brand is traditional in its appeal. All their packets have their mascot “Big Chief” on the front, and a different colour scheme represents each flavour. It’s a brand that is well suited to a fishing trip, or watching the footy with your mates. Geronimo’s “original” flavour is what you’d expect from a small jerky business. The primary flavours are soy, with a hint of garlic in the background that lingers afterwards. There is a nice level of salt that complements the other flavours without being overpowering. The idea with an original flavour is that it accentuates the meaty character of jerky above all else. The meaty flavours are carried well by the soy, salt, and garlic. We also like that there is hardly any sugar in this product. A talking point for us was the interesting texture of the product. Geronimo is a classic example of a jerky that is cut with the grain. The product is also one of the driest jerkies we’ve tasted. Dry jerky that is cut with the grain is typically harder to chew, and Geronimo jerky is no exception. This texture gives the product a distinctive and likeable character across all the Geronimo flavours. You have to “work” it a bit to get the flavours out. It makes it fun to eat, even it if it takes a bit longer compared to jerkies with a softer “bite”. We think this type of texture is perfect for a “laid back” eating occasion, like watching the footy with a few beers. Geronimo uses 100% Australian beef. Geronimo starts at $6 for a 40g bag, but has a variety of bag sizes up to 1kg. $6 for 40g is good value for jerky that far exceeds the quality of mass-produced jerky. However, there are no bulk discounts for buying more bags. Our tip – keep an eye on their facebook page because they’ve previously done 50% off sales. Now that’s good value! The larger bags are fantastic if you have a few friends to share the jerky with. If you can resist eating the entire bag be sure to store the remainder in an air tight container to prevent the jerky from spoiling. This is one of the best jerkies you’ll find in Australia. Geronimo jerky has distinctive texture, interesting flavours, and is solid nutritionally. It is far superior to anything mass-produced available in Australia, and compares well against the majority of “artisan” jerkies we’ve tried. We will list any updates to the review below.